Buy More Color Tissue Paper Flat 20x30 Save More! Raw Sienna Color Tissue contains 480 sheets measuring 20"x30", which are flat. Color Flo Tissue Paper is made from 100% Post Industrial Recycled Fibers. Green Way ® Eco-Friendly Packaging. Made in the USA. Add a pop of originality to any gift with your favorite shade of our 20x30 Color Tissue Paper! Great for the environment and your pocket, our 100% recycled tissue paper is available at wholesale prices. 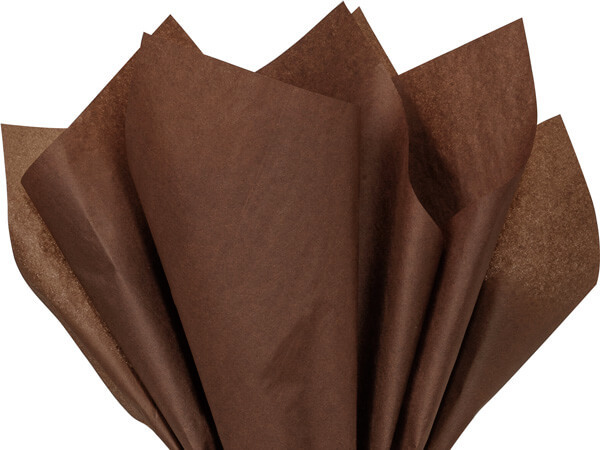 Packed flat in full reams of 480 sheets, our bulk tissue paper helps save you from quickly running out of product and having to deal with the inconvenience of frequent reordering. Available in 74 statement making shades, our color consistent tissue paper is exactly what you need to create that final wow factor. From a perfectly pieced together presentation to a fun decoration or craft, this is a product you'll always want to have on hand! We know that finding the best products for your packaging needs is not always an easy task. As a company that makes their tissue paper right here in the USA with both pride and tradition, we truly stand behind our product and believe that you will too! Blind tests have shown that our tissue is equal to or surpasses the look and feel of any color tissue on the market today. Similar to other 100% recycled products, there is always a slight chance of short fibers showing tiny pin holes or flecks. However, there is no need to worry because we can guarantee this does not take away from the performance or look of this durable tissue! Select colors ship only to US destinations from a separate warehouse. Please allow an extra 3-5 days for delivery. Pair with one of our Printed Cellophane Sheets!